I recently bought a copy of the 3rd edition rules of one of my favourite games which is Warhammer Fantasy and one of the reasons why I opened this blog. As soon as I started to read it I decided I would do a review in the blog, I remember a few years ago when I started to get interested in older versions of Warhammer at the same time as I started to lose interest in newer versions, I could not find a proper review of the rules. I am not saying it does not exist, I was just not able to find it! To prove me wrong I just found out this article among others from the Realm of Chaos 80s blog that talks about the book. So there you go, I will try to make a review and try to capture the main points that catch my eye! Disclaimer: This is not a comprehensive review and it contains only my opinion. It might also contain errors or missing information, this is only intended as a brief overview of the rules for players who know 4th or 5th edition for example. Let's start with the book itself. The copy I have is a massive book of 300 pages with soft-cover. If you do not have a copy you can find it in scribd here. If I were to compare the volume with recent ones, it would be unfair, as the 3rd might excel in rules and background information but the newer ones have brilliant design and are gorgeous to look at. This one is from the early 80s and you can feel it, which one of it's charms anyway. Nevertheless, let's go over the chapters one by one, shall we? Well, the fact that you have a full chapter of ~20 pages dedicated to just an introduction should already tell you something. Anyway it's nice to see they offer some explanation of all the usual techniques mentioned by painters, which is something very useful for beginners. It is also very interesting to see that there are two pages dedicated only to instructions on how to build your own gaming table. I remember reading an article almost like this one many years later in a White Dwarf magazine. Overall a very nice chapter that sets up the basic knowledge about miniature wargaming. The first thing that caught my eye from this chapter was the fact that there is a recommendation to have a Gamesmaster. This is just another of those things that brings closer this edition to a RPG, and also reminds you of the complexity of the rules, if a GM is in general recommended. I can see why in the subsequent editions they merged together the last four, as they are related, although different. Even though putting all together takes out the fine grain detail of the attributes it simplifies and streamlines the game a lot. To be honest, most of the races have the last four attributes always with identical values. 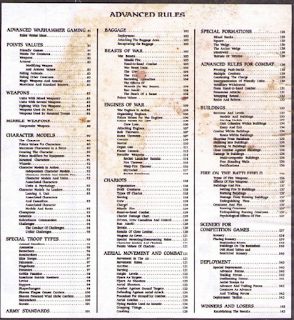 The movement section is quite similar to other Warhammer editions, save for the fact that there are more possible options for encumbrance and movement reduction penalties as well as for types of terrain. The manoeuvres and unit formations are also much more complex, although the basic idea is the same as in other editions. The shooting section sounds also familiar, although it is nice to see that there is some reason behind the apparently random maximum ranges of weapons. It is all based from the maximum range for a long bow, and everything else compared to that, as it could not be any other way, since it is a game created in UK! I don't remember reading this somewhere else, but I might be wrong. In the hand-to-hand section the first thing we read is an explanation on how to charge, that again, sounds familiar. And in this edition, the attacks are resolved by order of initiative, in case of a tie, the ones who charged will attack first, although you do get a +1 to hit when charging. There is a very interesting rule that is not present in other editions, which how to resolve the combat. When you win, you push-back, which means you will move directly 2" backwards the losing unit and the other unit will follow-up, unless some special conditions apply. Which means the line of combat will be much more dynamic than in other versions of the game, as the units will keep on pushing each other and not being fully static. Another rule that will add to the carnage of hand-to-hand combat is the free hack, when a unit routs and flees, the opposing player will get a free attack, but all attacks hit automatically. Wow! Now we come to a very interesting section, which is the reserves. During that phase, in your own turn, you may move again troops that are at 4" or more of your enemy. This is to represent the redeployment of troops during the normal course of a battle, just another reminder of the purpose they had when writing the rules. Not only to create a rule set for fighting battles in a fantastic realm, but also to back it up a bit with historical fluff, when possible. I know that in other editions you can sometimes move extra, but that always happens during the movement section, and never after the hand-to-hand. The rest of the chapter talks about basic psychology rules, leaders, musics and standard bearers. 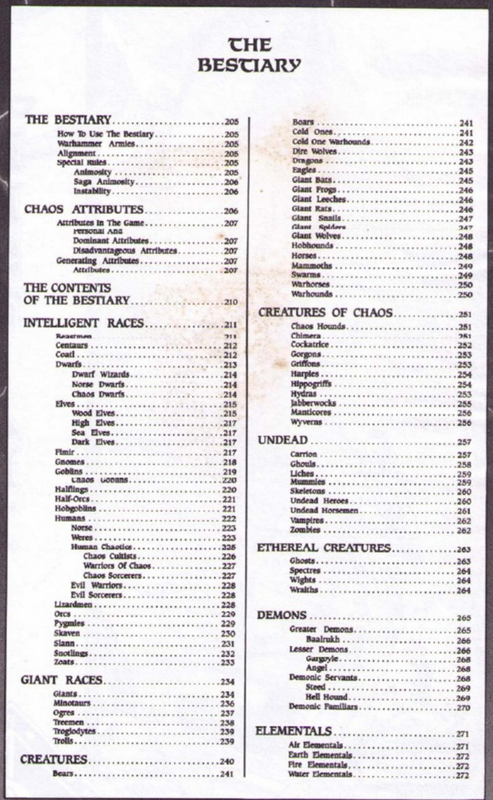 This brings the whole chapter to about 35 pages long, while the advanced rules are about 60! I will not go over the details of this chapter as it is the longest one, I will only mention some of the things I like. First thing you find in this chapter is a section called Rules versus ideas which states "The typical game is of above average intelligence, willing to improvise and invent where necessary, and always keen to try new ideas (...)" and ends up as "(...). However, for strict competition between unfamiliar gaming groups, it is necessary to stick to a more formal version of the rules to avoid confusion." They even recommend not checking the points unless needed for a fair troop allocation! I believe something like this was only found in subsequent editions in the editor's comments coming from people like Rick Priestley or Jervis Johnson, but sadly, this is not found anymore in the latest books. It seems to me that this is core to the whole wargaming experience. After reading the weapons section we go over the characters. This is again very influenced by the role playing experience, as you need to create your own character, by choosing or randomly assigned. From level 5 to level 25, there is a chart on how to do it that includes the explanation. Challenges are also explained in detail, and they are different from other editions. Another rule that caught the eye is the baggage. Mixing again wargaming and historical armies, they added a rule to include baggage area depending on your army's size, with rules about how to fight for it. 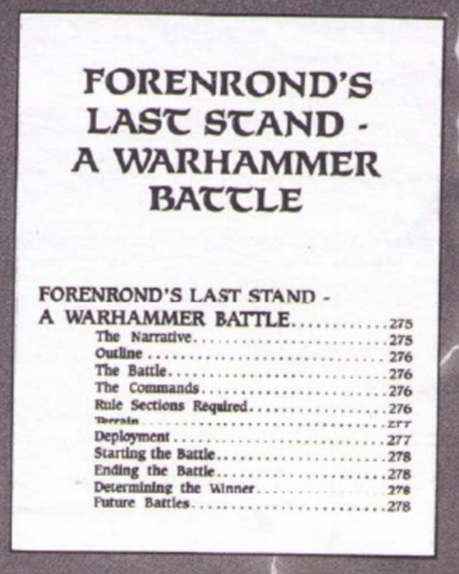 It is worth noting that in the special troops as well as in the engines of war, there is a list of almost all the known types of the game, so you do not need additional books to play, although they are covered in more detail in the Warhammer: Armies, that I am hoping to talk about in a future post. The aerial combat is covered by its own section, and it is more complex than in any other edition. Each creature have several stats related to flying. Minimum and maximum flight speeds, acceleration and deceleration rates and height levels, that correspond to the amount of yards they are in the air, that match what kind of attacks they can do. The special formations section is also interesting. Here you can read about mixed formations for archers and spear men for example, box shaped formations, wedge formations and even testudo! We finish the chapter with rules about fighting in buildings, getting things on fire and deploying scenery. This chapter is again longer than the basic rules. We start by classifying the wizards into four magic levels with power levels from 10 to 40 that will give them magic points to cast spells. The rules to create a wizard are quite similar to the rules for creating characters. Interesting rules that are not common in other versions of the game are the ability to rest to recover magic points (spending a complete turn without actions) or spell casting prior to the battle. 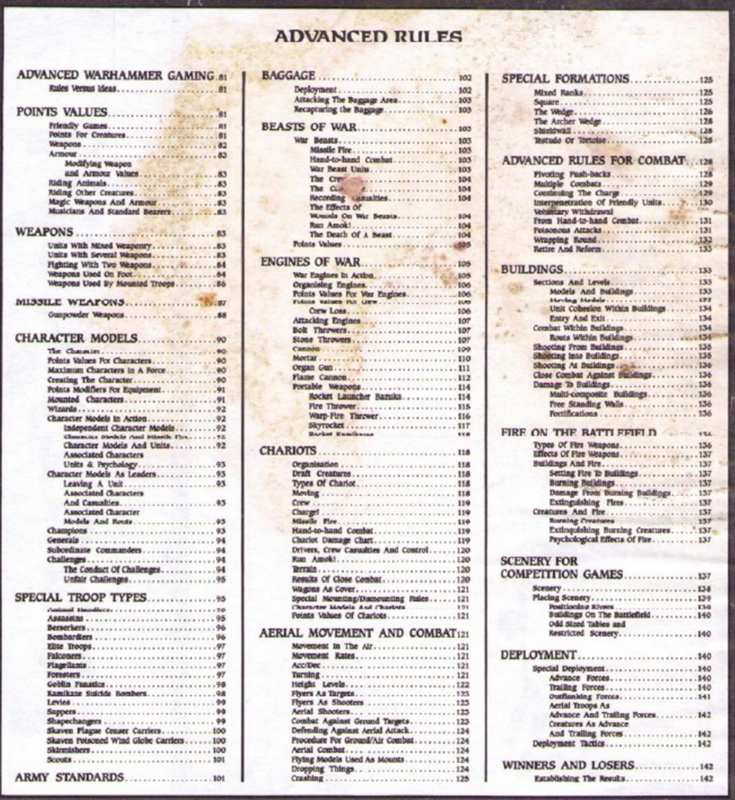 Then we jump directly into the spell index which is a massive list of 30 pages with dozens of spells and magic kinds which reminds you of a Rolemaster book and not Warhammer. I strongly encourage you to go over these spells and read them, they are very colourful and nice to read. 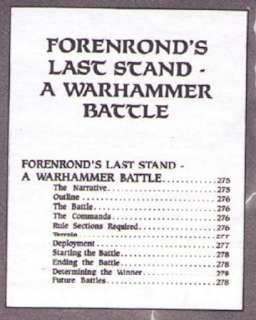 The whole chapter is the foundation of most of the Warhammer History that we have read over the years, although it includes more information than the more recent volumes regarding the origins of the world and the Slann. In general is a very nice read and quite refreshing, to be honest, compared to the latest versions. In some aspects you can feel that it is too new, and most of the history has not been written yet so there is not much to talk about, especially about the Empire, which in the latest books, usually is covered in extensive detail. 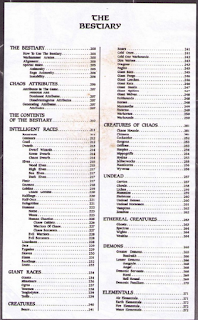 This whole chapter is dedicated to list all the possible races that live in the Warhammer World and that you can field in a game. It is a huge chapter of over 70 pages, which makes this book quite unique as it includes the rules and all possible "Army books" as we know them now. Of course you can (and should!) use the Warhammer: Armies to prepare your army, but it is quite convenient to have such a self-contained book. I will not go over this chapter in detail, only to mention that again you find rules to create your own creatures with abilities and disadvantages. 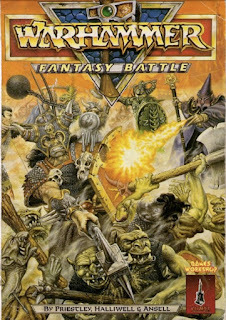 After all the chapters have been covered, an example of battle organized by a GM is included. With background and troop preparation. Nice to see that they mention the exact rules sections you need to know in order to play, which is cool as otherwise people might be a bit overwhelmed by a 300+ page book. And with that the whole book is finished. To sum up, it is a very cool book that even if you do not play 3rd is nice to own. It would make a very fine addition to any Warhammer lover book collection. It contains lots of nice little details as well as drawings and background information. It is basically the cornerstone of all editions from 4th to 8th. Good to read your review, and hear your thoughts on the book. I have recently bought the book and am reading it now! Let me know when you are done what rules caught your attention. I am curious to see what people reading it for the first time after so many years think! Cheers! I started playing warhammer at 5th edition then stoped at 6th from a feeling of being priced out of the hobby. Ive since been collecting again but nostalgia is strong so im collecting 4th & 5th edition bits. Because of the herohammer tone of 4th & 5th i play with the tournament rules & set 25% army points for character allocation. Looking online at older warhammer players blog's 3rd edition seems very popular. I looked through the rule book via scribd last week. I will be implementing free hack, fleeing, armour encumberance, the extra formations & baggage area rules to my games from now on. The 3rd edition is a good read & so was your blog. Let me know how does it work out for you, I might as well try it myself!